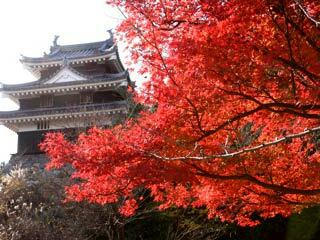 Nishio Castle (西尾城) is a flatland castle located in Aichi prefecture. It was built in1585 by Sakai Shigetada. It is very unique castle because the Tenshukaku was located in Ninomaru, the 2nd bailey. Today, there is 3 stories keeps, Otemon gate and garden are reconstructed. The baileys and moats are preserved in great condition. There is a museum in this castle. At the museum, you can get a map of Nishio. Built in: 1585 by Sakai Shigetada. It appears in the record of 1557, and Sakai Masachika became lord of Nishio castle in 1561. In 1585, Sakai Shigetada built Tenshukaku by the order of Tokugawa Ieyasu. In 1590, Ieyasu moved to Kanto, and Tanaka Yoshimasa ruled this castle. In 1878, Nishio Castle was abandoned.